Asmask Capsule is a unique herbal blend that controls Asthma, prevents allergic bronchitis, clears air passage and related respiratory disorders. It also helps in improving your immunity level and promoting general health. 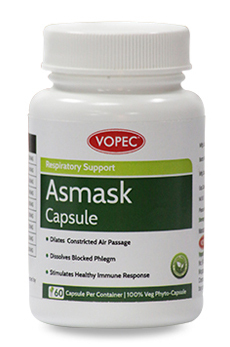 Asmask capsules are helpful in providing relief from Lung Congestion. This formulation expands the constricted air passages and supports easy breathing. It dissolves and expels mucus blockages and provides relief from tightness in the chest. It guards the throat & airways from irritation by forming a soothing film over the respiratory tract. The formula also enhances the immune system to fight against allergens, dust and atmospheric pollution which are known to be chief causes of asthma. There have been no safety precautions identified during clinical assesment. However, it is recommended to avoid use during pregnancy and lactation. Take one or two capsules twice a day after meals or as directed by your physician. Immune System can be stressed and may require an additional boost. Is there any toxicity concern shown in the study of Asmask Capsules? Some herbal chemicals can induce mutations and can also be responsible for future mutations. Mutations are responsible for abnormal cell growth that could lead to toxicity and cancer. To test that there is no such effect, Asmask capsules have been subjected to comprehensive research study. Using analysis known as 'bacterial reverse mutation' method, Asmask capsules have been tested for mutagenicity, toxicity and carcinogenicity. The study showed that there was no significant finding for such toxicity.